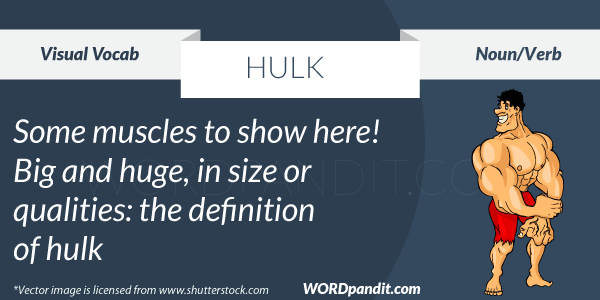 Hulk is a word made popular by the comic character ‘Hulk’ and the subsequent movie ‘Hulk’. Considering the popularity of Mr. Hulk, we decided we might as well use it for our purpose. With respect to nautical definitions, hulk means heavy or unwieldy ship. And the same characteristics when applied to a human being, we get something similar of the Hulk character in the movie. a. A heavy, unwieldy ship. b. The hull of an old, unseaworthy, or wrecked ship. c. An old or unseaworthy ship used as a prison or warehouse. Often used in the plural. 2. One, such as a person or object, that is bulky, clumsy, or unwieldy. 3. A wrecked or abandoned shell of a usually large object, such as a building or vehicle. 1. The white hulk of the former Musical Museum, now in disrepair, dominates the spot. 2. It’s just an old hulk of a building, with rusting steel and decaying concrete.